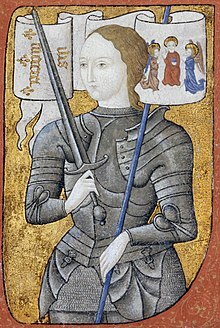 Jehanne Darc (1412 – 30 May 1431), also known as Jeanne d'Arc (Joan of Arc), was a mystic visionary, military leader, martyr, saint and heroine of France. Executed by fire as a heretic after sentencing by a tribunal of pro-English clergy, she was later cleared of the charges during an appellate trial of the Inquisition on 7 July 1456, and canonized as a saint of the Roman Catholic Church on 16 May 1920. Simple: I do not know whether god loves or hates the English, but I do know that they will all be kicked out of France, unless they die here. Simple: You say you are my judge. I am unsure that you are! But you must be careful to judge me well/fairly, because you will put yourself at risk. I warn you, so that if God punishes/disciplines you for it, I cannot be blamed for not telling you. Simple: Kids say that people are killed sometimes for speaking the truth. When asked about her childhood and what she did. Simple: I learned to spin (wool) and sew; and I am as good as any woman at spinning and sewing in Rouen. Asked if she told her troops that copies of her pennant would bring luck. The poor folk gladly came to me, for I did them no unkindness, but helped them as much as I could. Simple: The poor like me, for I caused them no harm, but helped them when I could. Simple: You take great care to record/write everything that goes against me in this trial, but you will not record/write down anything that agrees with me. I am a good Christian, properly baptized and I will die... a good Christian. And if I were condemned and brought to the place of judgment and I saw the torch lit and the faggots ready, and the executioner ready to kindle the fire, and if I were within the fire, yet I would say nothing else and I would maintain unto death what I have said in this trial! Simple: Even if I were about to be burned alive, I would say nothing else (confess) then what I have already said at this trial. I saw them with these very eyes, as well as I see you. On how she recognized the saints of her visions. I beg all of you standing here to forgive me the harm that I may have done you. Please pray for me. Jeanne-darc.dk Various materials including a complete English translation of the rehabilitation trial transcript. Joan of Arc in the First World War by B.J. Omanson, covers interest in Joan of Arc during the First World War. Joan of Arc Museum in Rouen, France. St. Joan of Arc Center of Albuquerque, New Mexico, maintained by Virginia Frohlick. This page was last edited on 25 October 2009, at 19:19.